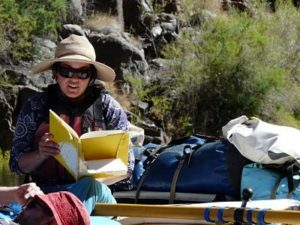 Guide Clare Magneson shares one of her favorite river stories. Photo By Cara Shonsey. 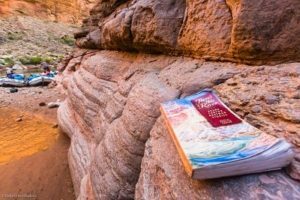 There are hundreds of Grand Canyon river stories. Therefore, along the Colorado River through the Grand Canyon, there is a story to tell nearly every mile. These stories tell of moments in history, intense emotion, extreme danger and river life. The ultimate experience is to hear a story told in the moment by a river guide. The tales are great because the guides infuse their own passion into everything they say and do. They love the Canyon, the river and everything that embraces their Grand Canyon world. It shows in the stories they tell. Harlan Taney tells a story about ancient people who once lived in the Canyon. Photo by Rob Elliott. It is not always about the story, but the way the guide tells the story. They find the perfect moment of silence, insert a pause for anticipation and add their own emotional angle. Fronteras Desk, a southwestern public radio station collaboration, captures some of these moments in an audio series titled Arizona River Stories. Senior Field Correspondent Laurel Morales interviews five river guides. As a result, she released five audio clips. Each clip captures a compelling short story told by the guide that personally resonates with them. Hence, the stories radiate passion, emotion, experience and personality. Listen to the stories first hand as if you are right next to them on the raft or at camp. 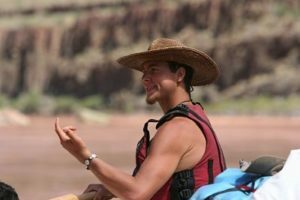 Also, this unique audio series features staff from Arizona Raft Adventures. Dave Edwards, Colorado River. Photo by Ralph Hopkins. Brad Dimock: Listen to Brad tell the tale of Glen and Bessie Hyde and their honeymoon trip down the Colorado River. Laura Fallon: Laura shares a story about one of her most favorite passengers of all time. Betsy Harter tells a dangerous story about a close call she had on a raft adventure in Costa Rica. Dave Edwards reveals a chilling experience about saving the life of a guest after a flash flood overtook their group in Havasu Creek. Christa Sadler explains what it was like to be on the river during 9/11. You can go on ten trips down the Colorado River through the Grand Canyon you will continue to be mesmerized by different stories told by different guides. And with every trip, a new story unfolds. As a result, guests often write on their post-trip survey just how much the guides positively impacted their experience. It is not uncommon for guests to comment about the guide’s amazing ability to help them connect to the experience. Consequently, it is often the guest whom is actually impacting the guide’s life. Listen to the audio clips and you will hear for yourself just how true this is. Boatman Stories, Grand Canyon National Park, Arizona. Photo by Ralph Hopkins. In conclusion, if it is not realistic for you to experience Grand Canyon river stories first hand in the Canyon. 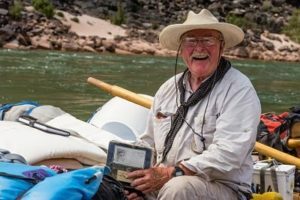 Here are two good reads that feature collections of Grand Canyon river stories: There’s This River…Grand Canyon Boatman Stories by Christa Sadler and Travelers’ Tales Grand Canyon; True Stories of Life Below the Rim edited by Sean O’Reilly, James O’Reilly and Larry Habegger.